Although it is possible for a daemon of Chaos to directly manifest itself within the physical realm, it is very difficult. The barriers between warpspace and realspace must be weakened by rituals and sacrifice, and even then the daemon can only appear for a comparatively short length of time. Daemonic possession is a more common form of intrusion, where a daemon imparts some of its power and will into a physical host. Like manifestation, possession is normally limited in time, but can be extended almost indefinitely if certain ceremonies and procedures are performed at the time of possession. This can drag a daemon from the warp and trap it inside the possessee, creating a creature known as a Daemonhost. These are created for a number of different reasons. Some are willing volunteers, members of Chaos-worshipping cults who give over their bodies so that their master may walk amongst them. Others are less self-sacrificing, having been captured by a cult and waking with a daemon living inside their mind - an experience likely to drive even the most strong willed into insanity. Inquisitors, particularly the Daemonhunters of the Ordo Malleus, also create Daemonhosts. Some use them merely as a way of interrogating daemonic entities about the warp and its powers, refusing to free the trapped daemon until they have answered their questions. Other Inquisitors, particularly those who have no psychic powers themselves, use Daemonhosts as psychic fighters. The presence of a warp entity inside a physical body eventually takes its toll on the Daemonhost, but until they are finally consumed by the power raging within them, they are potent beings. Their possession and the enchantments placed upon them protect the Daemonhost from the attentions of other warp creatures, while the daemon's own powers can be manifested by the host. When unleashing their mental powers, Daemonhosts tap directly and efficiently into the warp, allowing them to channel enormous amounts of energy, which will eventually consume them if they are not released of their possession. They appear to be caught in a gale of psychic power: eyes blazing, clothes and hair rippling in an unnatural storm, raw energy arcing from their skin, their fingertips crackling with inhuman force. As well as this, the host may well benefit from a number of special invulnerabilities particular to daemons, and will be almost impossible to harm without certain weapons or in a certain way. Daemonhosts do however have some peculiar weaknesses brought by their unnatural union too - some can be killed with silver, others must feed on fresh blood to survive, some cannot stand daylight, while others have an aversion to symbols of faith. No matter how strong-willed the host is, eventually the possessing Daemon will begin to corrupt the body that it inhabits. This is very much reduced if the proper rituals have been undertaken, but month by month, year by year, the Daemonhost will physically change to suit the needs of the entity residing within their soul, reflecting its inhuman nature. Its eyes will start to change, perhaps going blood red or taking on the look of a cat's or snake's eyes. Its skin will start to take on an unnatural sheen, while the skeleton may also undergo changes, resulting in vestigial horns, tails and other daemonic features. Equipment: Daemonhosts do not carry much equipment, if at all, and the level of those items they do carry depends on who created them. 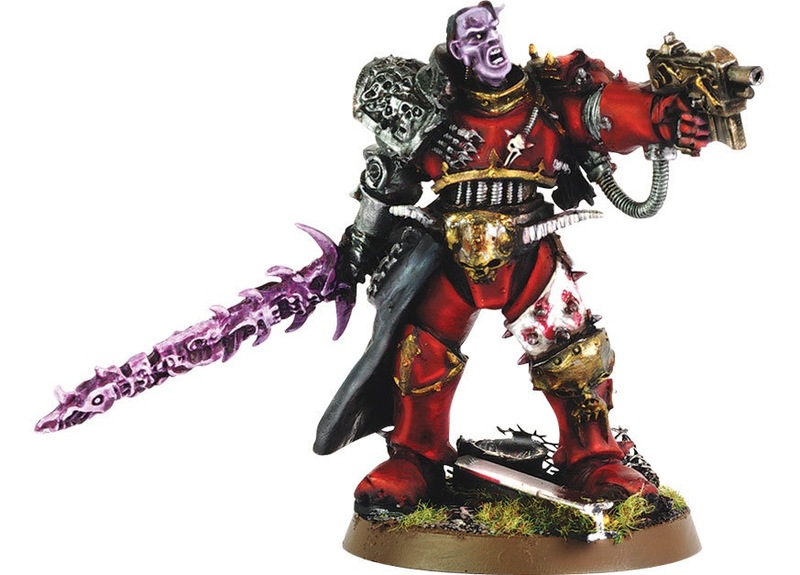 Ordo Malleus Daemonhosts, for example, will have the best technology available, whilst a Daemonhost of a Chaos cult will carry what their masters can scavenge. Special Abilities: Daemonic; Fearsome; Possession. Almost all Daemonhosts have psychic powers.